Wanting to learn how to defend yourself from a violent attack and only practising physical fighting type skills is like wanting to be safer on the road and only practising how to crash better. It seems crazy in that context but that is what most people focus on when they pursue self defence. Sure, car safety ratings and crumple zones and heaps of airbags are all very good but limiting our interest to only crashing is very short sighted. That’s obvious right? To be safer on the road it helps to look ahead, buffer away when passing oncoming trucks, understanding the sorts of things bad drivers do so you can avoid them, know where the local black-spots (high crash areas) are and understanding how blind-spots work are all far more important proactive measures to being safe on the road. The same goes for self defence. Limiting our focus to fight type skills is like limiting our interests in road safety to crashing better. Don't be the Volvo driver of the self defence world. Be smarter than that. Don't be ignorant of what is going on around you. Sometimes, possessing good fight skills can make us overconfident where we don't use those 'soft skills' and somewhat ironically can mean we are more likely to end up needing to use those fight skills. This is the same dumb attitude where Volvo drivers feel so safe and secure in their car that they tend be ignorant of what is going on around them and are more likely to either cause an accident nearby or be in one. Focusing on driver knowledge, driver skills and driver awareness is the primary area that will improve driver safety. We should take the same approach with self defence. Much like understanding where accident black spots are and what sort of accidents happen there is important, so too should those of us interested in self defence seek to understand where violence occurs in our neighbourhood and what sorts of violent crime is most common. Understanding the underlying nature of human violence will allow anyone with an interest in self defence to decipher the apparent mysteries of violent crime. It will provide clarity to what was previously fuzzy and disordered. Prioritising understanding over fighting is obvious from this vantage point but is rarely taught. Low Tech Combat is all about this smarter approach to self defence. Sometimes, it is shocking just how little some good fighters know about human violence and violent crime. Much like car safety ratings are still important in the grand scheme of things and are great at improving our chances of survival in the worse case scenario, so too is developing physical response skills for the rare occasion we find ourselves in a violent encounter. Sometimes, someone can just crash into us when unexpected. But if we want to be safer on the roads we don’t only go for the safer car. It shouldn’t be the number one thing we look for when we want to stay safe on the roads. It shouldn’t be the only thing we need to take care of to be safe on the roads. While driving a safer car should make up just a small part of staying safe on the road, some do it better than others. And yes, I will be linking this back to self defence in just a moment. Bare with me. When people are in the market for a new car, safety is typically an important consideration - especially for families with young children. But when shopping around, people typically start off their study of car safety from a very low knowledge base. This means they are susceptible to what car salesman tell them and what sponsored website reviews tell them. So even when they are actively looking to factor in car safety intelligently into their buying decision making, their knowledge on the topic is quite shallow meaning they are likely to make suboptimal findings. And then they are driving a car around for many years telling their friends how safe they think the car is. The same goes for self defence. When someone first starts being interested in self defence, they start looking around for either a local martial arts or local self defence school. Their knowledge to inform considered decision making is suboptimal. They are susceptible to what the school owners and instructors tell them. So even when they are actively looking to factor in desired self defence skills into their decision about what school to join up, their knowledge on the topic is quite shallow meaning they are likely to join a school that is ultimately not the best fit for them. But once they join up, they are committed and will be telling their friends about how good his school is for self defence training. We should primarily aim to be a safer driver. We should also primarily seek to understand violence first and have physical skills as a last resort. Physical skills are a lower priority. We shouldn’t focus only on the last resort at the expense of everything else that comes before it. That’s what Volvo drivers do. 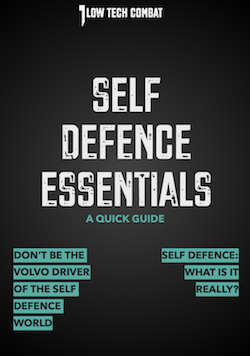 Don’t be the Volvo driver of the self defence world. That’s just embarrassing. As a somewhat self fulfilling prophesy, ignoring everything that comes before physical violence makes physical violence more likely to occur. The vicious cycle continues as the person who faced a physical encounter will likely double down on the physical aspect because it was the only aspect of the violence our protagonist was aware of. Focusing on all of the pre-violence aspects enables us to avoid, prevent, deter, detect and mitigate violence. With these sorts of skills you will be less likely to need to draw on those last resort physical skills. This is the same as the better more advanced driver having less need to rely on airbags and crumple zones in a crash. Ultimately, who is safer on the roads? A driving enthusiast who has undertaken advanced driver training (which always involves a lot of theory), knows about road accident trends, knows where the black spots are in their neighbourhood, actively scans the road ahead, doesn’t text and drive while at the same time owning an older car with zero airbags and brakes that are serviceable but not as good as modern cars. 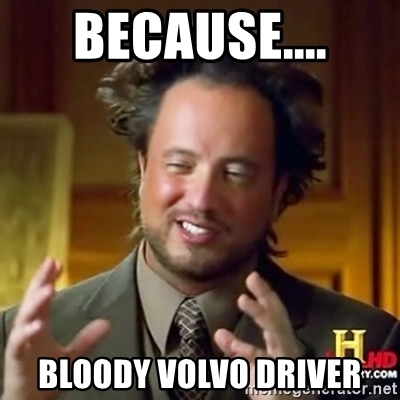 A Volvo driver who has undertaken no extra training besides getting their license, doesn’t really care for road statistic things and can just satisfactorily control their Volvo which he bought because it was one of the very safest cars on the road. He loves telling people how safe Volvos are. And who are you in the self defence world, number 1 or number 2? Who do you want to be? P.S. So yeah, I am picking on Volvo drivers a little here but I hope you get the point. If you like this post you will definately want to get your hands on the free Self Defence Essentials guide. This post is just one part of the guide and it's yours to download now in PDF format for free. Just tell me where to send it. Leave your email in that box below.